Spirit Gemstone & Coin Necklace - 20% OFF! 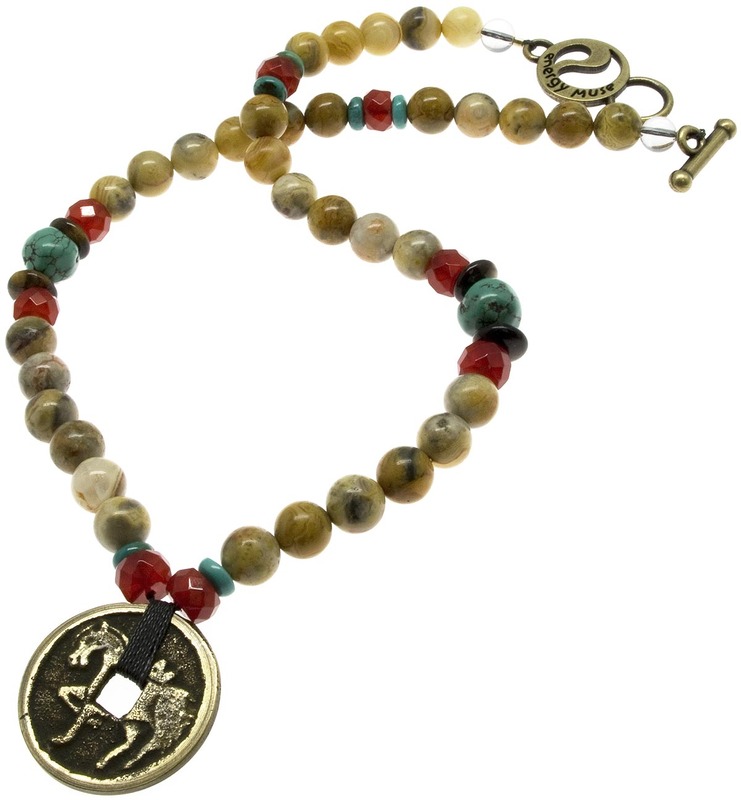 Exotic gemstone necklace features 100+ year old Balinese coin embossed with a horse logo and said to activate luck and wealth. This Spirit Coin Necklace is made of natural gemstones. The authentic Balinese horse coin is 100+ years old. Stones used include Agate, a powerful healing stone that emits strength, power and courage; it encourages concentration, focus and balance. Tiger's Eye is considered a good luck stone. It is good for protection and strengthening personal will power. Turquoise is a master healing stone. It is widely believed in the Middle East that tying a turquoise bead on the tail or mane of a horse will protect both the horse and rider from harm. Many people wear turquoise on the body or a belt buckle for the same purpose of protection. Carnelian is worn for joy, creativity and motivation. It helps to increase self worth and personal passion. The Balinese horse coin is considered to carry magical energy. "The Chinese coins used in the practice of feng shui (pronounced "fung shway") are considered to be the most powerful manifesting tools for attracting wealth, prosperity, and endless fortune, especially those from the extremely auspicious Qing (pronunciation similar to the English word "chin") or Ch'ing Dynasty. Round in external shape, the coins have a square hole in the center. The round shape symbolizes heaven, and the internal square represents earth. When used by humans, the coins represent the engagement luck of "Heaven-Earth-Mankind." Well, even if you think this feng shui stuff is a bunch of hooey - this is still a lovely bracelet with it's chunky natural stones and weighty antique charm.